You will find here a selection of publications relevant to Martian expeditions and their implementation. New references will be added they become available. ‘This book, as well as presenting new ideas on the planning of expeditions on Mars, can also be regarded as a field guide for future Martian expeditioners. It will provide some of the foundation knowledge for planning expeditions to the Martian volcanoes, poles, deserts and caves..’ (from the Foreward). This volume brings together perspectives of Earth and Mars explorers to consider the surface of Mars from the explorer’s viewpoint. A starting assumption is made that there is already a base on Mars that can support expeditions. Then, the authors describe how they would plan expeditions across Mars, including environmental, psychological and scientific factors that would influence these expeditions. This book, as well as presenting new ideas on the planning of expeditions on Mars, can also be regarded as a field guide for future Martian expeditioners. It provides some of the foundation knowledge for planning expeditions to the Martian volcanoes, poles, deserts and caves. The papers in this book are based on a symposium of the British Interplanetary Society held Feb. 24, 2003, London, England, plus numerous invited papers. The volume is divided into eight sections: Section 1: weather for Martian expeditions; Section 2: science on Martian expedition; Section 3: expedition challenges on Mars; Section 4: planning tools for expeditions; Section 5: expedition mobility; Section 6: expedition environmental impact; Section 7: expedition human factors; Section 8: expedition medicine. Numerical, author and key word index included. Laing, J. H. and G.I. Crouch (2005). ‘Extraordinary Journeys: An Exploratory Cross-Cultural Study of Tourists on the Frontier,’ Journal of Vacation Marketing, 11(3): 209-223. Laing, J. H. and G. I. Crouch (2004). ‘Flight of Fancy: Vacationing in Space,’ in Novelty Tourism: Strange Experiences and Stranger Practices, Singh, T. V. (ed. ), CABI Publishing, Wallingford, United Kingdom. Crouch, G. I. and J. H. Laing (2004). ‘Public Interest in Space Tourism,’ Journal of Tourism Studies, Vol 15(2): 26-32. Laing, J.H., J. Clarke, J. Deckert, V. Gostin, J. Hoogland, L. Lemke, J. Leyden, G. Mann, G. Murphy, C. Stoker, M. Thomas, J. Waldie, M. Walter and M. West (2004). ‘Using an Australian Mars Analogue Research Facility for Astrobiology Education and Outreach’ in Bioastronomy 2002: Life Among The Stars, Proceedings of IAU Symposium 213, Hamilton Island, Great Barrier Reef, Australia, July 8-12, 2002, R.P. Norris & F. Stootman (eds. ), Astronomical Society of the Pacific: San Francisco, U.S.A.
Mann, G.A., N.B. Wood, J.D.A. Clarke, S. Piechocinski, M. Bamsey and J.H. Laing (2004). ‘Comparative Fields Tests of Pressurised Rover Prototypes,’ Journal of the British Interplanetary Society, Vol 57, No. 3/4, February 2004, British Interplanetary Society. R. Persaud, J.D.A. Clarke, S.M. Rupert-Robles, E. Martinez, F. Karouia, J. Heldmann, A. Brown, M. Thomas, V. Waclawik, V. Gostin, D. Willson, S. Dawson, P. Krins, S.T. Sklar, J. Waldie, N. Cutler, and J. Laing (2005). “Expedition Two: An Interdisciplinary Mars Analog Research Expedition to the Arkaroola Region, South Australia”, submitted to the Canadian Space Agency, contract 9F007-4-6071. J.D.A. Clarke and R. Persaud (2004). 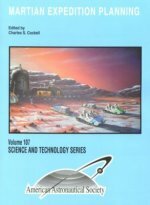 “Expedition Two: A Multi-Goal Mars Analogue Expedition to the Arkaroola Region, Australia”, Proceedings of the 4th Australian Mars Exploration Conference, University of South Australia, 2004. R. Persaud, S.M. Rupert Robles, J.D.A. Clarke, S. Dawson, G.A. Mann, J. Waldie, S. Piechocinski, and J. Roesch (2004). “Expedition One: A Mars Analog Research Station 30- Day Mission” (AAS 03-304), Martian Expedition Planning (ed. C. Cockell), American Astronomical Society. R. Persaud (2004), “A Systematic Approach to Investigations at Mars Analog Research Stations” (AAS 03-306), Martian Expedition Planning (ed. C. Cockell), American Astronomical Society. R. Persaud, S.M. Rupert Robles (2004). “A 5-Day Mars-Analog Pressurized Rover Mission” (AAS 03-317), Martian Expedition Planning (ed. C. Cockell), American Astronomical Society. S. Piechocinski, E. Cellucci, J.D.A. Clarke, J. Laing, B. Orlotti, R. Persaud, A. Solignac, N.B. Wood (2004). “Potential Capabilities and Uses of an Integrated Data Logging Device During A Human Mars Exploration Mission” (AAS 03-316), Martian Expedition Planning (ed. C. Cockell), American Astronomical Society. Schuerger, A. C. 2004. Microbial Ecology of the Surface Exploration of Mars with Human-Operated Vehicles. In: Martian Expedition Planning, ed., C. S. Cockell, Univelt Publishers, Santa Barbara, CA, American Astronautical Society publication AAS 03-322, pp. 363-386. Schuerger, A. C., Mancinelli, R. L., Kern, R.G., Rothschild, L. J., and McKay, C P. 2003. Survival of endospores of Bacillus subtilis on spacecraft surfaces under simulated Martian environments: Implications for the forward contamination of Mars. Icarus 165(2):253-276. Schuerger, A. C., Ming, D., Newsom, H., Ferl, R. J., and McKay, C. P. 2002. Near-term lander experiments for growing plants on Mars: Requirements for information on chemical and physical properties of Mars regolith. Life Support & Biosphere Science 8:137-147. Schuerger, A. C., Richards, J. T., Hintze, P. E., and Kern, R. 2005. Surface characteristics of spacecraft components affect the aggregation of microorganisms and may lead to different survival rates of bacteria on Mars landers. Astrobiology 5(4):545-559. Nicholson, W. L., Schuerger, A. C., and Setlow, P. 2005. The solar UV environment and bacterial spore UV resistance: Considerations for Earth-to-Mars transport by natural processes and human spaceflight. Mutation Research 571:249-264. Clancey, W.J., Sierhuis, M., Alena, R., Berrios, D., Dowding, J., Graham, J.S., Tyree, K.S., Hirsh, R.L., Garry, W.B., Semple, A., Buckingham Shum, S.J., Shadbolt, N. and Rupert, S. (2005). Automating CapCom Using Mobile Agents and Robotic Assistants. American Institute of Aeronautics and Astronautics 1st Space Exploration Conference, 31 Jan-1 Feb, 2005, Orlando, FL. Available as AIAA Meeting Papers on Disc [CD-ROM]: Reston, VA, and as an Advanced Knowledge Technologies Project ePrint [http://eprints.aktors.org/375]. Clancey, W. J., Lee, P., Cockell, C. S., and Shafto, M. To the North Coast of Devon: Navigational Turn-Taking in Exploring Unfamiliar Terrain. In J. Clarke, Mars Analogue Research, AAS Science and Technology series, in preparation.